I've spent most of my introspective thoughts lately focused on the horizon. Dreamin, schemin, hanging out with the sparkly what if's and I hope's. Until this morning. Pastor Compton stopped me cold in my tracks as he drew my mind's eye back 365 days and pushed the fast-forward play button. An instant lump moved into my throat and brought along chill bumps. 2011 has been an amazing chain of events. Some links in the chain seemed small, some seemed mountainous. All links took me one step closer to today, and I really like today. A year ago today I was basking in the glow of a newly thawed heart. I had my eyes closed and my face into the wind of living free because Jesus loves me so much. I've spent the entire year studying and thinking through the book of John, and I'll be taking it with me into 2012 because I'm not done yet. I see Jesus in a way I never have before and I feel like I love Him in a way I never have before. It's more of a grown-up real love. Solid, steady, deep. The time I've spent at John's feet learning to love Jesus have been the hands-down highlight of 2011. Then the secret turned into a plan, and a place. I found that my warm heart had pieces of it beating in Ethiopia. Warm hearts feel sharp pain. I started to try to pray for children who I know are mine but I haven't met yet. I've done this before, but never this way. It took me a long time to get beyond, "Jesus, please...." followed by ugly sobs that leave a headache behind. When my stranger child is in my belly I monitor my folic acid and protein intake for brain development. I pray for health, protection, and I'll admit it, good looks. Now, looking back, I realize my prayers for the babies in my bellies have been pretty shallow. As I'm learning to pray for my babies across the ocean I know that they're not going to have good nutrition, health, and protection. The precise reason that they are MY babies is because they don't have these things and they need me. So, how do you pray when you know the circumstances aren't going to get better for a while? You pray, "Jesus, please.....please do what only You can do for them and do it big. Please be more than food and health to them and teach me how to heal their little hearts that haven't been protected. Jesus, please..."
This year I've lost my ability to say "I need...." Hearing those words come out of my mouth makes disgusted. What in the world do I need? I find myself staring into space wondering about that a lot more these days....I have shoes....I ate too much today...my house is warm....thoseare shiny things. This year I'm learning that I like the look of my house better with glitter glue evidence where little fingers have crafted. I'm learning that talking stuffed animals and blankies can earn much quicker, much funner obedience than stern-ness and discipline. (thanks Scott, for the lesson of the talking dolphin, you made me a better Momma!) I'm learning that time stands still and I don't grow older every moment I'm looking arrow-direct into my child's eyes. This year I got to remember how good it feels to be part of a team that travels far away with a mission. I loved being able to say "Obrigada" when I was handed a yummy glass of sugar cane juice. I love taking people places they've never been before and introducing them to people I love. 2011 let me take 4 of my own kids on one of these trips. This year I've watched the man I love refine and chisel. He's so very good at what he does. Ministry isn't his job. Pastoring isn't his vocation. He is a pastor who lives ministry with every part of his life. He loves people far and wide. I want to be more like him. This year I've found out, again, that I love following him. Hitching myself up to his wagon train 20 years ago was one of the best moves I've ever made! This year, I bought the sweatshirt and proudly proclaimed myself "Soccer Mom!" I realized that I am the next generation of Mom Floridas on the bleachers when soccer season comes and I have two boys that suit up. Game days I woke up thinking about the games, counting down the hours till it was time to claim my spot on the bleachers. I relished the rubbery hot dog dinners we bought from the other mom's in the Booster's shack. I cooked team dinners, wore my stylish rain suit over my snow suit and still shivered through the last game of the season. I even offered my own good luck to the team by not washing my "rally sweatshirt" till the season was over.....good thing girls don't sweat, they just glisten!! Soccer season is a whirlwind couple of months, and I. just. plain. LOVE. IT!!! A mom sitting next to me on the bleachers videoed the last big win....an exciting shoot-out. When she posted it on facebook, it took me a couple watches before I realized that my voice is the crazy woman you hear in the background spastically laugh-cheer-hollaring. Kinda like the snort-laugh....embarrassing but strangely exhilarating to realize that you are that girl. This year I found out that I like to write. This isn't the first year I would have labeled myself as someone who can write, but this is the first year it's been fun. In high school and college I wrote papers because there was a due date and a grade attached and because turning things in on time is what good little first-borns do. Somewhere along the way, I started to realize that I liked the feeling of handing in a finished product that I felt proud of. I started collecting phrases, well-turned words, strings of words put together just right...like Grandmas collect teacups. So, when I was in my 20's and a friend asked my what big dreams I had, a vision of myself as a writer materialized. My friend pushed and prodded and I got starry-eyed. I enrolled in a correspondence writing course that used up 6 years worth of our budgeted entertainment money. That was about 15 years ago....and I'm a Correspondance Writing Course drop-out. I finished a lot of lessons, I learned a lot.....but oh, it was hard. I really wanted to do it, but I always felt a niggling fear that I was faking it. I could put words together to express ideas, but I wasn't sure that I had had any ideas that were really worth expressing. Life happened, babies came, staying up late to finish my latest assignment became less and less important. I hung up the pencil and shelved the writer dream. When it did enter into my mind in my 30's, I just started asking God to give me things to say someday....to help me live a life worth talking about. These sweet new babies of mine have given me a gift...a story to tell and a reason to be a writer. This blog started to keep adoption stories chronicled for me and them, and became something more. The stories of the adoption welled over into stories of how great God is and how good this life is that He's given me. Writing is still hard sometimes, but it's a different hard, the "I just gave birth to something really great!" hard that leaves me hungry to do it again. This year I had some really, really great girlfriend moments. I know 2011 is the new banner year for the "Most Tears Cried with Girlfriends" title. Talking about orphans with the girls....hmmmm....tears, but really, really good tears. The girlfriend equation of this year is as follows: the amount of time spent honestly face to face with the girls = hunger for God and courage to live. I'm a girl who by nature hovers around her lists and projects and doesn't notice that she's been without people until it's been a really long time. I'm becoming a girl who leaves her list in the dust and heads to coffee and texts "all-calls" when I'm heading to Target (ok, I only did that once in 2011, but lots more are coming in 2012!). This year I've felt a magnetic pull to home. Not just the home I'm making here and now, but the home that was made for me. I've been relishing the time I spend at home in Mom and Dad's world and hungering for more of it. It's a place where I can just be, where stories get told, games get played and home movies eventually come out. It's such a great place to be from and 2011 has showed me that I want to soak it up. This year, I've found out that, contrary to my long-held assumption, I don't want to be normal. There's no way to write it that will make it sound as monumental of an announcement as it feels. It's Washington Monument, Sphinx, Great Wall of China big. Being normal, fitting in, feeling like I'm one of them is something I've thought I always needed....one of the shallow parts of me that's risen to the surface this year like a bloated dead body. I bought a coffin for that dead body in 2011.....it's in the shape of a big, silver, 12 passenger Ford van. Having to upgrade to a church van was a serious obstacle for me as we considered this adoption thing. It was a gulper of a sacrifice for me to make - the alter upon which all my normal American middle class soccer Momma-hood would be sacrificed. I've started to turn the corner, though. I'm realizing that having coffee brown faces in my family pictures and driving a church van as a family car are both things that are going to let me tell my story. Reasons for people to ask questions. Reasons for me to point out how great God's been. I think I'm really starting to be good with stepping out of the ranks of normal.....although, I did tell Scott that I'm gonna hunt down a pair or two of fabulous boots to be wearing when I step out of my very non-normal van to prove to myself and the world that I'm being non-normal in a fabulous sort of way. 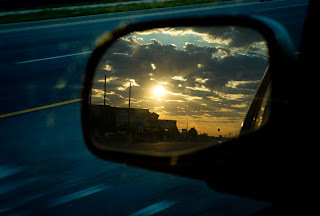 So as I think and dream about 2012 and what might be around the next bend, I'm really getting a kick out of what I'm seeing in my rear-view mirror. The last 365 have been a really good ride.....the sun's been shining, the wind's been blowing, we haven't run out of gas, and when it rains the wipers have worked most of the time. I love road trips.....and the horizon looks particularly good in view of the rear-view mirror. Thank you for sharing your amazing words! I am excited for your new chapter in life. When It Rains, It Pours Through Those Floodgates!